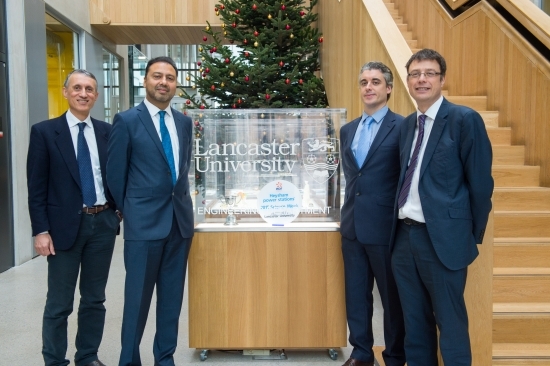 Lancaster University and TWI are joining forces to create a new centre of excellence for smart and advanced manufacturing systems. The collaboration’s ambition is for the ‘Joining 4.0 Innovation Centre’ to become world-leading in researching and developing smart manufacturing systems. The centre will focus on ‘joining’ technologies in the context of Industry 4.0 – a term used to describe what many experts believe is the ongoing fourth industrial revolution. The Industry 4.0 revolution is based on ubiquitous embedded sensors in objects, known as the ‘Internet of Things’, ‘big data’ streams and analytics as well as decentralised and bespoke manufacturing. In this new world products communicate directly, and automatically, with production machinery to tell it exactly what to make and smart factories use increased automation and artificial intelligence to deliver better quality goods or services at higher levels of efficiency – thus increasing productivity. The centre, which will be owned by Lancaster University, will operate from TWI’s 54,000m2 world-class facilities in Cambridge, and will concentrate on advancing knowledge in the next generation of joining technologies – such as additive manufacturing (known commonly as 3D printing). The partnership will leverage both organisations’ strong research bases and enable the fast transfer of research breakthroughs to TWI’s established network of 700 industrial members – increasing opportunities for the centre, and collaborators, to significantly impact the UK economy. These members are active in industries such as aerospace, automotive manufacture and oil and gas, as well as energy and nuclear technologies. The centre’s research focus complements the government’s industrial strategy, which has identified robotics and autonomous systems and advanced materials as two of eight great technologies in which the UK is set to become world leader. TWI will initially fund eight PhD researchers, over five years, to advance understanding in Industry 4.0 technologies. The Joining 4.0 Innovation Centre forms an additional pillar in Lancaster University’s broader engagement in meeting the UK productivity challenge – in addition to the university’s participation in a government-initiated Science Innovation Audit focused on the creation of a Northern Powerhouse Advanced Manufacturing Innovation Corridor; the national Productivity Leadership Group and a pilot Productivity Through People Programme supporting enhanced leadership in senior managers in advanced manufacturing businesses; and strategic links to other universities, Local Enterprise Partnerships and industrial partners. It also builds on research excellence within TWI as well as Lancaster University’s department of engineering and data science and materials science institutes. Professor Stephen Decent, Pro-Vice Chancellor for Research and Enterprise at Lancaster University, said: ‘This exciting new partnership with TWI will deliver world-leading science, innovation and skills necessary to put the UK in the centre of the fourth industrial revolution. Professor Aamir Khalid, TWI Director of Technology, commented: ‘The establishment of the Joining 4.0 Innovation Centre marks a significant step towards securing the UK’s position at the forefront of digital manufacturing and joining innovation within the Industry 4.0 environment.